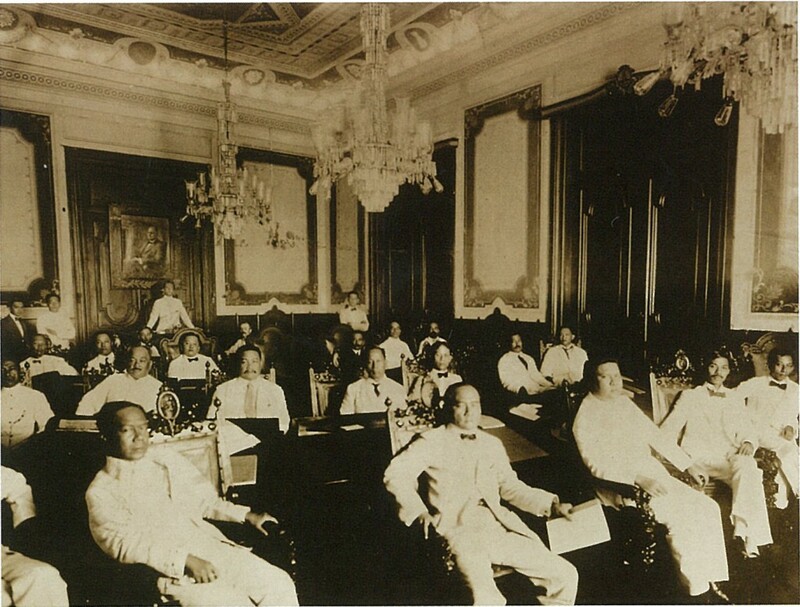 The Senate of the Philippines with Manuel L. Quezon (back of the room) presiding. 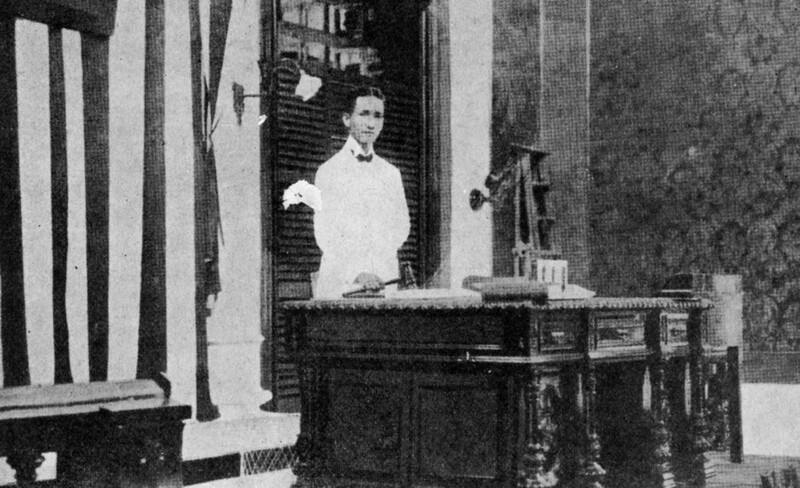 Quezon was one of three Presidents of the Philippines who served as Senate President. His counterpart in the House, Speaker Sergio Osmeña, was one of two Philippine Presidents who became Leader of the House of Representatives, the other being Manuel Roxas. Since the first State of the Nation Address (SONA) was delivered by President Manuel L. Quezon in 1936, the opening of the regular session of the legislative branch of government has been marked by a message from the President of the Philippines on the state of the nation. This is a function of two additional roles of the chief executive and the legislature: For the chief executive, it is a constitutional duty in keeping with established traditions worldwide, where the head of state opens parliament; for the legislature, it is an acknowledgment that aside from legislation, another function of Congress is oversight: the SONA is in essence an annual report to both houses of the legislature. With few exceptions (World War II, Martial Law, 1986 Edsa Revolution), this tradition has been honored throughout the history of the Philippines, and it continues to this day: On July 23, 2012, President Benigno S. Aquino III will deliver his third SONA during a joint session to mark the opening of the third regular session of the 15th Congress of the Philippines. Of the 15 men and women who have served as President of the Philippines, 12 have previously served in the legislature. The exceptions are Presidents Emilio Aguinaldo and Fidel V. Ramos, who served in the military, and Corazon C. Aquino, who became President through a popular revolt. Even among this minority, however, links to the legislature are evident: The fathers of both Ramos and Aquino served as Representatives in the Lower House. (Above) Speaker of the House Ramon Mitra Jr. with Representatives Raul Daza, Hernando Perez, Albertito Lopez, and Lorna Verano-Yap. 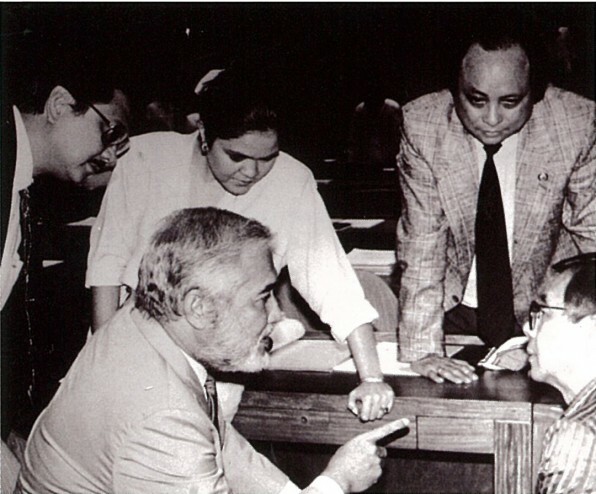 Mitra lost a bid for the presidency in 1992; (below) On the day of their inauguration, President-elect Manuel Roxas and Vice President-elect Elpidio Quirino descend the stairs of Malacañan Palace with President Sergio Osmeña. Osmeña and Quirino were both Senate Presidents Pro-Tempore. Roxas was a former Senate President. Since its foundation in 1916, the Senate has been considered as a training ground for the presidency, particularly since 1941, because of its at-large, nationwide constituency and tradition of erudite debate. As such, all Presidents with the exception of five (Aguinaldo, Magsaysay, Macapagal, Corazon C. Aquino, and Ramos) had experience in the Senate. In fact, Quezon, Roxas, and Marcos were also Senate Presidents, whereas Osmeña and Quirino were Senate Presidents Pro-Tempore. By extension, three Senate Presidents were eventually elected President: Quezon, Roxas, and Marcos. Other Senate Presidents ran for either Vice President or President, but were unsuccessful. There have also been Senators who, after failing to win higher office, were eventually elected Senate President. Thus far, the only President to have served as senator after his term was Jose P. Laurel, who considered his election to the Senate in 1951 a political rehabilitation from charges of wartime collaboration. Two Presidents, Osmeña and Roxas, served as Speakers of the House. Six Presidents did not have experience in the House of Representatives prior to serving as President: Aguinaldo, Laurel, Corazon Aquino, Ramos, Estrada, and Macapagal-Arroyo. 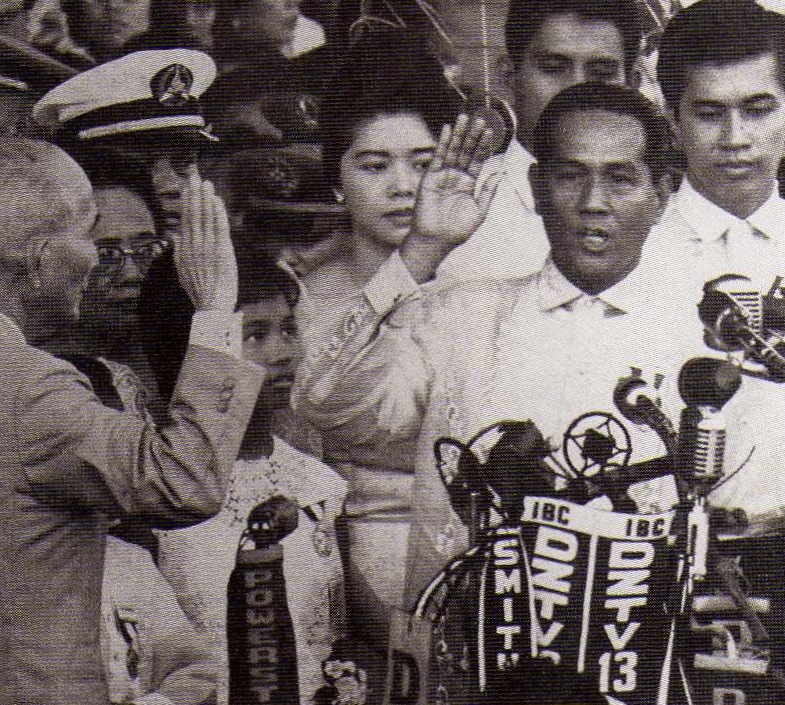 Diosdado Macapagal takes his oath of office as President of the Philippines in 1961. In 1957, he was elected Vice President. Prior to this, he served as Representative of Pampanga in the Lower House. 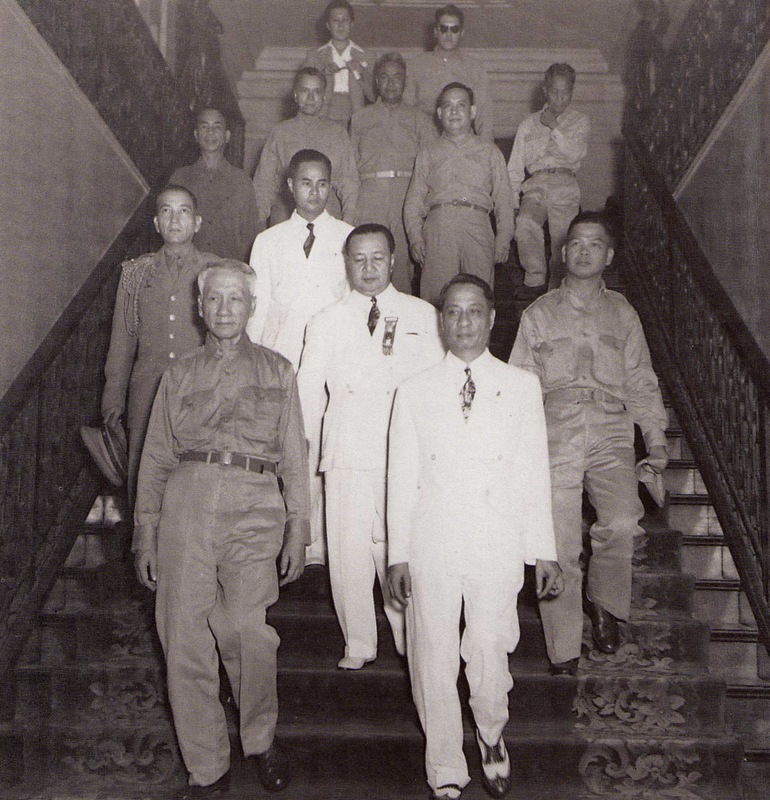 Ramon Magsaysay, then a Representative from Zambales and Chairman of the House Committee on Defense, was chosen by President Elpidio Quirino to be his Secretary of National Defense. Magsaysay, who is credited for neutralizing the HUKBALAHAP threat, was eventually recruited by the opposition and successfully challenged Quirino’s reelection bid. The untimely death of President Magsaysay resulted in the ascension of Carlos P. Garcia to the Presidency. Seeking his own election to the Presidency in 1957, Garcia recruited House Speaker Jose B. Laurel Jr. for Vice President to go up against the tandem of former House Speaker Jose Yulo and Pampanga Representative Diosdado Macapagal. For the first time, the election resulted to the President and Vice President coming from separate parties: Garcia, a Nacionalista, and Macapagal, a Liberal. Four years later, Macapagal would defeat Garcia for the Presidency. Philippine electoral history shows that the House Speakership is a weak springboard for higher national office. All Speakers of the House who have sought either the Presidency or the Vice Presidency were unsuccessful. Two Speakers became President: Osmeña and Roxas, but both also served in the Senate. Some former House Speakers had moderate success in pursuing higher office, though only Manuel Roxas, who was Speaker from 1922 to 1933 and subsequently Senate President from 1945 to 1946, has been elected President. Before him, Sergio Osmeña, who had served the longest as Speaker from 1907 to 1922, was elected Senator and Vice President, then later ascended to the Presidency following the death of President Manuel L. Quezon in 1944. Roxas would defeat Osmeña for the Presidency in 1946. Thus far, the only President to have served in the House of Representatives following her term is Gloria Macapagal-Arroyo, who represents the 2nd District of Pampanga in the 15th Congress. Sergio Osmeña was the first Speaker of the House—one of two Philippine Presidents who became Leader of the House of Representatives, the other being Manuel Roxas. His counterpart in the Senate, Manuel L. Quezon, was one of three Presidents of the Philippines who served as Senate President.